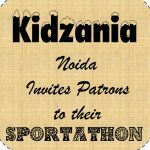 To end 2017 on a sporty note, KidZania Noida and Adidas curated a two-week Sportathon for their patrons. From Football and Basketball to Table Tennis and Zumba – patrons really need to gear up for the most-awaited Uprising in the month of December. They also had amazing awards to be won for the activity. December is definitely the season to be jolly, so Kidzania Noida gave you just the right headstart. The entire event was planned around motivating people to take a step forward for fitness. Among other activities enjoyed by my twins, was the Zumba Activity. The Activity was scheduled to start by 4:00 PM and we were told about this in advance. Just as it was about to strike 4:00, quite a huge gathering of young and old people alike assembled. The Zumba instructor joined us soon enough and had very clear instructions on how to follow her. She started with very simple moves, just to get the group warmed up and begin to feel their heart beat rise. People started to enjoy the simple, fun dance moves while they also exercised. The trainer was cooperative and gave a lot of individual attention to the participants of the activity. The Zumba activities did get a bit intense, but the peppy music kept playing. With the upbeat music, participants just wanted to somehow keep up with the movements of the trainer. Many of them were doing it for the first time. The trainer was easy going and did not expect them to do Zumba like a pro on their very first attempt. The best part about being doing Zumba is that it does not tire you completely. It makes you feel the rhythm and the rise in your heartbeat. You also sweat a bit, but just after the Zumba work out, you tend to feel more energized and active. It was enough to give participants a hang of what Zumba workouts are all about. It was enough to let them know that it possible to ‘dance’ your way to fitness. With Indian adaptations of the work out regime, there are some excellent Zumba versions of Bollywood music. So if there are people who enjoy dancing, and are also seeking some kind of a fun work out regime, then Zumba is just the thing. Kidzania Noida is THE place to be for my kids. It was their birthday on Monday, so being a Sunday, we took them to Kidzania. The fire station, the hospital, the Kiwi activities, The animation studio, Parle factory, Chocos factory, and others, are some of the favorite spots for my kids. They ensure that of all the activities, we don’t miss these at all. For hours, days and weeks, my kids keep repeating the fun things they did at Kidzania and are always very keen to revisit the place. You may also like to see my review of Kidzania on my Youtube Channel here. Do subscribe to my channel and shower me with some love. Have you been to Kidzania Noida? How has your experience been? Do share with me in the comments. Do SHARE this blog with your friends so they know what a fun place it is to be at KIDZANIA NOIDA. the place is really cool and such events are a good change for both parents and children…….. I really like the activities Kidzania organised for both parents and kids. Your kids look so involved in the activities. The activities looks safe and learning for them. Wowww.. This is super fun. I could totally imagine the enjoyment it would have been for you and your kid. wow !! This place looks super duper fun. Your twins look super happy. Let’s plan together as I so wanna visit this place. Wow! This looks like a great fun place! Love all these beautiful pictures❤ Would love to visit this place with my son when I visit Noida next time. Kidzania is an awesome place for parents and kids enjoyment! My friend had visited this place and her baby loved it. That’s a fun event at Kidzania, I would have loved to join if I had known this earlier. Anyways I am already too impressed and will be taking my kid there very soon. Definitely looks like a great place to spend valuable time with kids doing what they love.